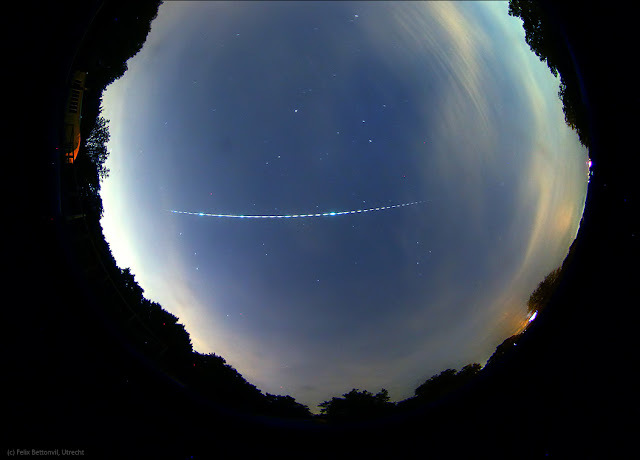 In the evening of 21 September 2017 at 21:00:10 CEST (19:00:10 UT), a brilliant fireball, as bright as the first quarter moon, appeared over the Netherlands. It was widely seen and reported and garnered quite some social media and press attention (e.g. here). The next day I was live in a Dutch TV program to talk about it. 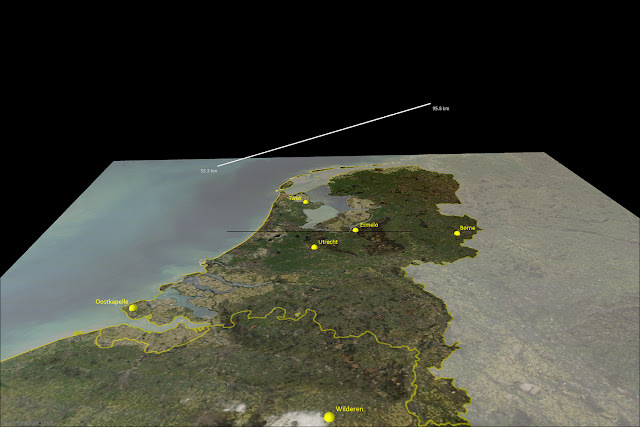 The fireball was captured by six all-sky camera stations of the Dutch-Belgian all-sky meteor camera network operated by amateurs of the Dutch Meteor Society and KNVWS Meteor Section: stations Ermelo, Oostkapelle, Borne, Utrecht, Twisk and Wilderen, operated by respectively Koen Miskotte, Klaas Jobse, Peter van Leuteren, Felix Bettonvil, Marco Verstraaten and Jean-Marie Biets. The image in the top of this post shows the photograph taken by the all-sky camera in Ermelo (courtesy Koen Miskotte), where the fireball appeared almost right overhead. The image below was taken by the all-sky camera in Utrecht (courtesy Felix Bettonvil), showing it slightly lower in the sky (click the images to enlarge). 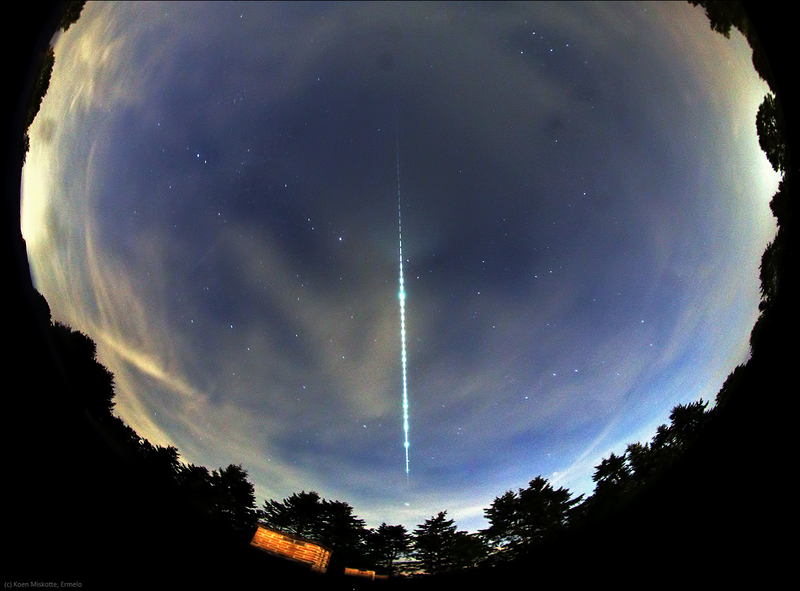 In the photographs above, the "dashed" appearance of the fireball trail is caused by an LCD shutter between the lens and the camera CCD, which briefly interupts the image at a set interval. For Ermelo this was 14 interuptions per second, for Utrecht 10 interuptions per second. 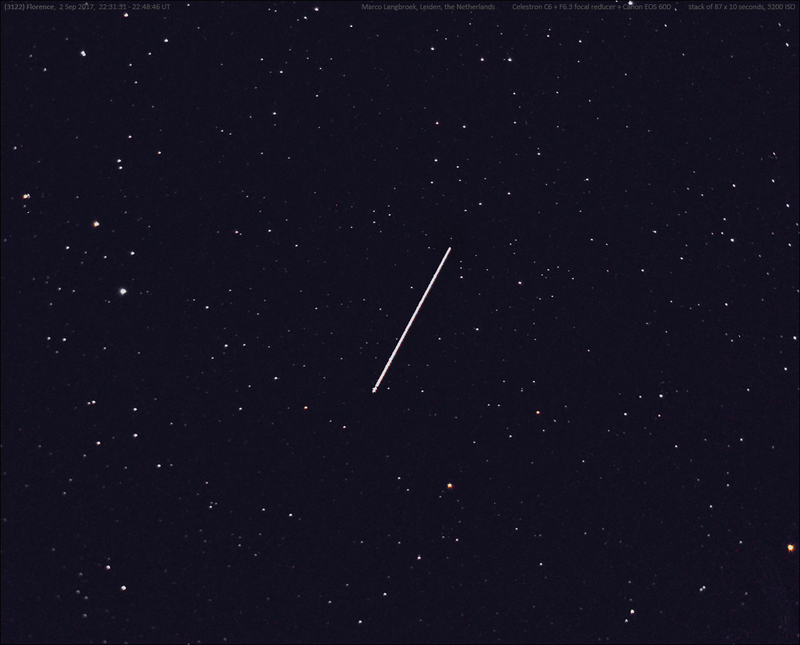 Knowing the shutter frequency you get the duration of the fireball by counting the number of shutter breaks in the trail: in the case of this fireball, it lasted over 5.3 seconds. Together with triangulation information on the path of the trail in the atmosphere, it gives you the speed of the fireball in km/s, which is necessary to calculate the orbit in the solar system. It also provides you with information about the deceleration of the meteoroid in the atmosphere. In this case, it entered the atmosphere with a speed of 31 km/s and by the time it had completely burned up at 53 km altitude, the speed had decelerated to 23 km/s. The fireball fragmented into pieces quite early during its atmospheric entry. Some of these fragmentation events can be seen as brief brightenings (flares) in the images. 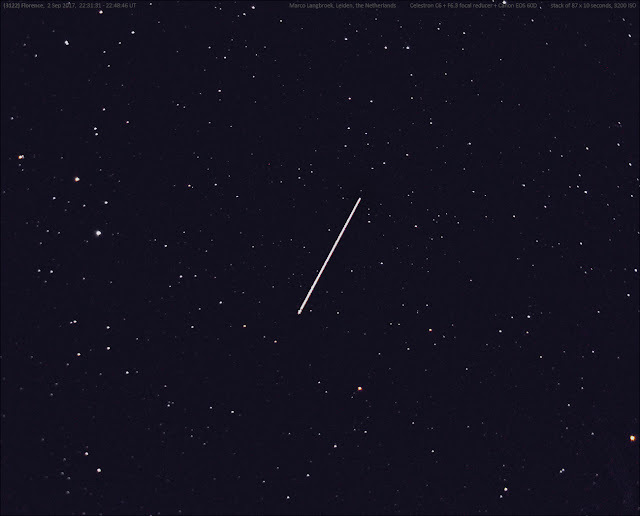 Atmospheric trajectory of the fireball, calculated by the author. Camera stations in yellow. The fireball moved almost due east-west. It started over Deventer, crossed over southern Amsterdam and Schiphol airport, and ended over sea. 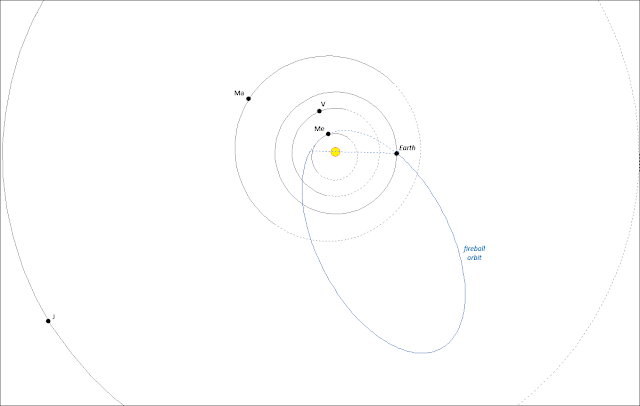 The end altitude at 53 km and end speed of 23 km/s indicate that nothing was left of the original meteoroid by the time the fireball extinguished: no meteorites reached earth surface, it completely ablated away. 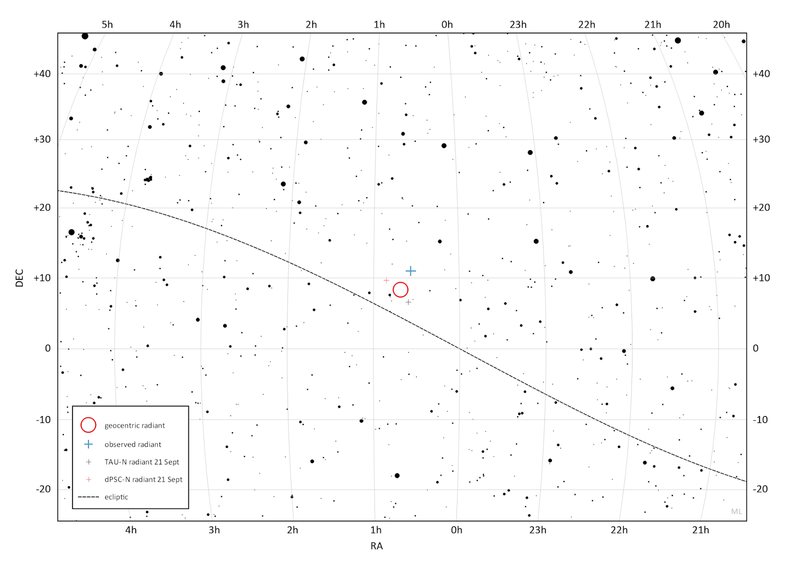 The apparent radiant of the fireball was located low in the sky, at 16 degrees elevation and almost due east. The grazing entry into the atmosphere resulted in a long trajectory length of over 150 km. 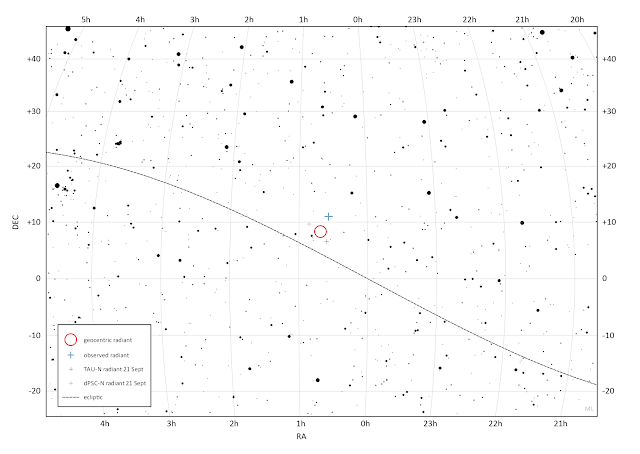 The geocentric radiant of the fireball is located on the Pegasus-Pisces border, just north of the ecliptic. The radiant and speed, and the resulting orbit in the solar system, show that this was an early member of the northern branch of the Taurid stream complex, a meteor stream complex associated with comet P/Encke. It is active from September to December with a peak in activity in November. The stream is broken up in several substreams, and the early Northern Taurids from September are sometimes called Northern delta Piscids, one of these substreams in the Taurid complex. The radiant position and heliocentric orbit for this fireball are shown below. Acknowledgement: I thank the photographers (Koen Miskotte, Klaas Jobse, Peter van Leuteren, Felix Bettonvil, Marco Verstraaten and Jean-Marie Biets) for providing their imagery for this analysis. 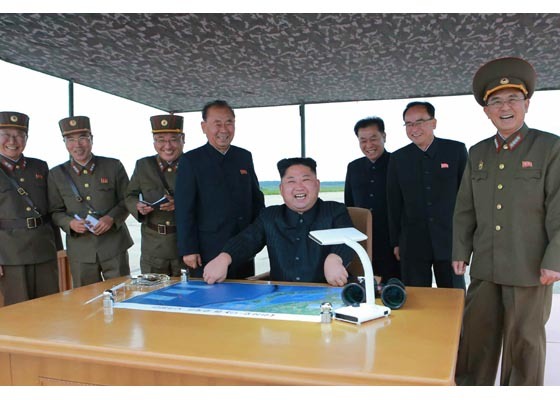 The image above (from North Korea's KCNA) shows the North Korean leader Kim Jong Un and a map. It was likely taken on the day of the 29 August missile test that shot a Hwasong-12 MRBM over Japan, into the Pacific Ocean. I analyzed this map and what it shows in detail in my previous post, showing that the trajectory which seems to be sketched on the map deviates from the real missile flight path. But there is more to this map, it turns out after further analysis. There are not one, but two subliminal messages contained in this map. The first subliminal message, already discussed at the end of my previous post, is that it depicts a 3300 km trajectory (the real flight trajectory appears to have been shorter, 2700 km). This is the approximate distance to Guam. But there is a second subliminal message. The map also contains a veiled threath to Hawaii. As can be seen in the annotated georeferenced version of the map image above (see also my previous post), the trajectory skeched on the map (white) is very close in direction to what a trajectory towards Hawaii would be. - The yellow dashed line shows what the trajectory is if launched into the same azimuth as for targetting Pearl Harbour, but with a shorter 3300 km range, as on the map in front of Kim Jong Un. 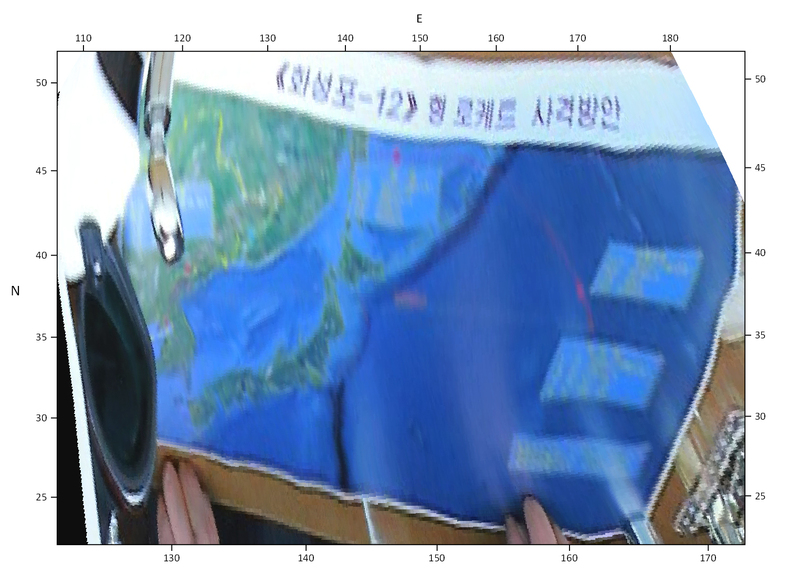 The latter yellow line obviously is very close to what is sketched on Kim Jong Un's map. In fact, I think that within the error margins of my georeferencing effort, they might well be the same. The white line, my best effort to represent the trajectory sketched on the map, would be a missile launched into azimuth ~77.25 degrees. The dashed yellow and green lines, are both for missiles fired into azimuth ~76.9 degrees. 76.9 and 77.25 degrees are very close, a difference of only ~0.35 degrees. To clarify further what the map depicts: the reason that, even though the launch azimuth is the same, the green and yellow lines do not overlap is because of earth rotation and earth curvature. Firing a missile into the same azimuth (~76.9 degrees) from Pyongyang Sunan, yields a slightly more southern trajectory if the range of the missile is ~3300 km (as on Kim Jong Un's map) instead of ~7400 km (the distance to Pearl Harbour). This is because a flight to Pearl Harbour takes longer in time, and the earth surface is meanwhile rotating under the flight path. So the trajectory sketched on the map contains two subliminal messages: the length (~3300 km) is roughly the distance to Guam. The launch direction is the launch direction towards Pearl Harbour. Two veiled threaths in one. No wonder Kim Jong Un smiles so exuberantly: "Riddle this, you Imperialist agressor Puppets!". I firmly believe that the North Korean propaganda machine deliberately includes these images into what it makes public. When they show a map or monitor with a trajectory, however oblique and vague, it is not unintentional but (I firmly believe) intentional.